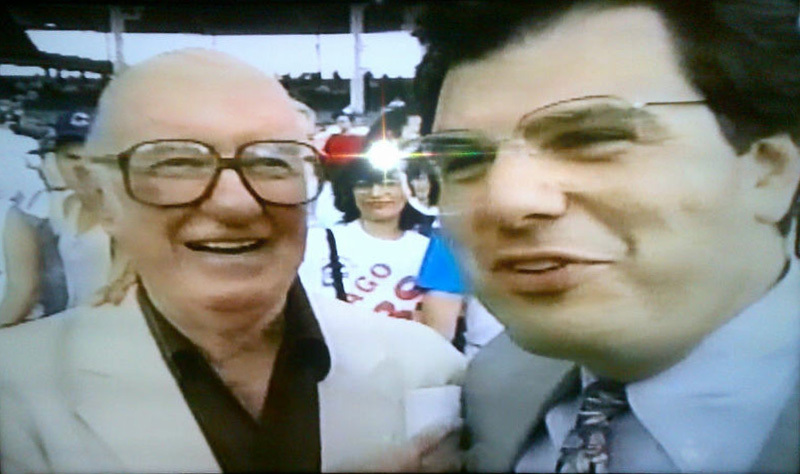 Tom Shaer (right) does a TV interview with Jack Brickhouse at Wrigley Field, 14 years after Brickhouse helped Shaer break into the Chicago market on the “Sports Central” radio show. 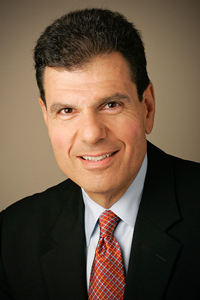 (Longtime Chicago sportscaster and media consultant Tom Shaer, a Massachusetts native, broke into the Chicago market more than three decades ago as Jack Brickhouse’s junior partner on a nightly WGN Radio sports-talk program. The following are Shaer’s remembrances of those days). Jack Brickhouse was among the nicest, most considerate and honorable people I have ever worked with in an industry not adequately populated with truly decent human beings. Jack constantly reinforced a lesson I learned while working for Associated Press Boston Sports Editor Dave O’Hara: a good reporter builds trusting relationships with people he covers, which leads to inside information, to be used responsibly. Most importantly, he taught me sports broadcasting is not the same as covering the U.S. Senate or major developments in brain surgery. It should be fun for the fans, via the media. To be sure, he understood reporters, such as I, played a different role than team-sanctioned play-by-play men. But there was an “edge” to my work that needed softening, and Jack showed me how. You see, the Boston way of covering sports back then was to be tough, skeptical, and, well, not fun. Chicago’s approach was much softer and I bristled at what I saw as a lame, tolerant and lazy local sports media which perpetuated the fraud of decades of incompetent, do-nothing team owners. I felt Dallas Green and Jerry Reinsdorf were right to shake things up, as they’d begun to do. However, Jack showed me that, yes, I could be a tough and thorough reporter and, at the same time, loosen up on the air and present my coverage in a lighter, more fun way — when appropriate. I learned from him that one adapts to the market, speaks the language of the locals, understands their way and thus gently introduces his or her reporting to them on more mutual terms. This made a huge difference in my rapid acceptance by listeners and viewers (I was also a fill-in sports anchor on WGN-TV). The Brickhouse-taught approach was the catalyst, right there before me each day. Jack never forgot his Peoria roots. The fact that Jack Rosenberg, Vince Lloyd, Chick Hearn, Bob Starr (Cardinals, Angels, Red Sox), Bob Elson (who hired Brick at WGN in 1940) and others all grew up and/or worked in Peoria and environs was a source of immense pride for him. Jack loved telling stories of his days doing play-by-play for a perennially successful Bradley basketball program. Broadcasting is a business filled with big egos, often necessary to develop confidence to speak “in front of” hundreds of thousands or millions of people. Ego fuels confidence, which overcomes fear. Jack had one of the best-managed egos I’ve ever seen in my 36 years in media. He followed Rudyard Kipling’s admonition in the poem, “If.” He walked with kings, yet kept the common touch. This was a man who was either friends or acquaintances with people from Ernie Banks to Ronald Reagan to both Mayor Daleys, but he was equally interested in the new grandchild of the doorman at the Tavern Club. The best example of Brick’s relative lack of ego was the fact that he never, ever begrudged Harry Caray all the success Harry had with the Cubs. In 16 years with WGN, Harry got much more exposure (with better teams and a superstation), commercial opportunities and salary than had come Brick’s way in his more than 40 years on the job. Green, Reinsdorf, the McCaskeys and some WGN executives were respectful of Jack’s accomplishments and he, in turn, cheered on those broadcasters later employed by their teams. 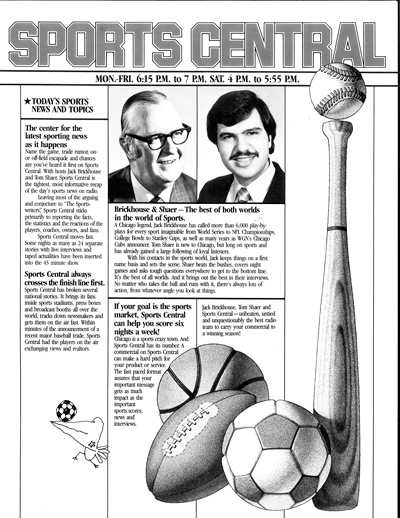 WGN Radio’s promotional handout for “Sports Central” with Jack Brickhouse and Tom Shaer in 1983. When Jack retired from Cubs play-by-play after the 1981 season, he was assured by Tribune Broadcasting chief Jim Dowdle that he would have a meaningful future role with WGN. But, months later, no details and no offer had been presented and no substantial conversations had occurred. That is when the upstart Reinsdorf/Eddie Einhorn-backed SportsVision, overseen by former WGN executive Jack Jacobson, approached Brick. The new venture offered Jack carte blanche in creating a role there. Keep in mind, no one knew if this revolutionary all-sports pay-cable channel would reduce WGN’s enormous footprint in the Midwest. So, WGN was now in the position of having to prevent the competition from stealing its former marquee talent whose star power name would lend instant credibility to any new enterprise. Thus, Tribune Company now hurriedly followed through on its promise to Brick with a role more substantial than Dowdle’s earlier vague descriptions. 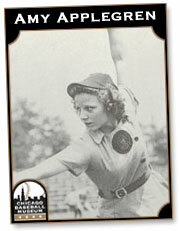 The result was the nightly WGN Radio “Sports Central” show, with Jack the main talent and Chuck Swirsky his co-host. I was hired a year later to replace Swirsky, who had a lot of new work on WGN Radio. There is no evidence that Dowdle would have done such a significant deal had SportsVision not been a perceived threat. Brick also got the title of vice president of special projects with the Cubs, which may have been a way to assign some of his salary to the Cubs budget within the labyrinth of the company’s Tribune Entertainment division. Jack had a fancy office in the executive area on the west side of the WGN building on Bradley Place, a block from Lane Tech High School and two miles west of Wrigley Field. However, he spent very little time there, preferring an older, smaller office just off the newsroom. When Jack and I worked together, radio and television were still in that same North Side building and shared the newsroom; radio moved back downtown to Tribune Tower in 1984. Each day at four o’clock, Jack crossed the first floor from his main office and grandly entered the WGN news hub, shaking hands with everyone and answering their questions about the Cubs. He was in his element. Jack’s role was well-defined. He was the headliner on “Sports Central,” and I did the daily hustling as co-host and producer. Yes, Jack had been a rah-rah play-by-play professional, not a “reporter,” but he embraced this new role. By the time we began working together in 1983, he was 67 and enjoying the well-deserved benefits of being the elder statesmen in the two stations’ sports department. Still, he offered assistance at all times. He opened his extensive rolodex, helping me reach important people while trusting my planned structure of each night’s show and suggesting changes which improved that structure. Tom Shaer learned from Jack Brickhouse how to better balance his reporting in his first job in the Chicago market. In one memorable two-hour span, Jack connected me with Willie Mays, then-MLB Commissioner Bowie Kuhn, Bobby Hull, the doctor for the then-dying Arthur Wirtz, Sting owner Lee Stern and Billy Siegel, owner of That Steak Joynt, where I needed a table for two after the show. Each call was the same, though I have a favorite. I have to say this honestly. At my hiring, Chuck Swirsky told me, “Jack is coasting and won’t work hard. You will have to do everything and it’ll be irritating. I haven’t enjoyed it.” WGN Radio Program Director Dan Fabian nodded his head in sympathetic agreement. They were both wrong. I experienced the opposite. I learned Jack wasn’t the problem. Respect and appreciation for his accomplishments meant a lot to him and I don’t think he’d received that respect during the grind of producing live programming, five-days-per-week. Jack never took advantage of his status or my 23-year-old’s energy and ambition. We got on famously. Long after I left WGN for WBBM Radio and, later, WMAQ-TV and WSCR Radio, Jack was deeply proud of the “Brickhouse Boys,” 11 sportscasters in Chicago and elsewhere in the United States who had been junior co-workers. We were all happily deferential to him and he, in turn, eagerly boosted our public image with generous and detailed compliments to print media, fans or others interested in our industry. 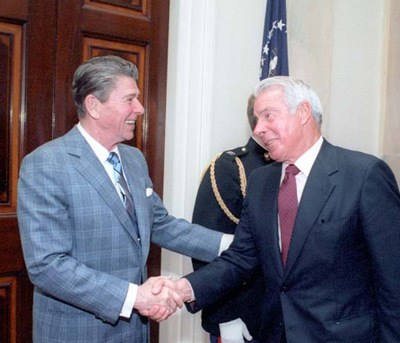 Joe DiMaggio greets President Reagan in 1981. Two years later, DiMaggio made Jack Brickhouse proud by introducing him as his fellow Hall of Famer. The 1980s brought new experiences for Jack. They included doing live locker room interviews on WGN-TV after the Cubs actually won a division title in 1984, announcing the Cracker Jack Old Timers Classic series of ball games, all-access involvement for the 50th Anniversary Major League Baseball All Star Game at Comiskey Park (brilliantly hosted by the White Sox), the All-Star Old Timers game and broadcasting trips to Washington, DC. When Jack was honored at the National Baseball Hall of Fame and Museum with the 1983 Ford Frick Award, it was a weekend of pride for everyone associated with WGN. Remember, previous winner Bob Elson was best known as a White Sox announcer and subsequent winner Harry Caray would wait six more years for his honor in Cooperstown. Brick’s selection was a big deal. I produced a tribute with play-by-play clips and guests including Kuhn, Mays, Cubs Chairman Andy McKenna, former Cubs TV partner Jim West and others. Jack was pretty choked up. On induction morning, he came on the air with me to relate how, the night before, Joe DiMaggio had introduced him to someone as “my fellow Hall of Famer.” Heady stuff. Years later, after he’d finished his run on “Sports Central,” Brick settled into a role he seemed to treasure: that of being a local treasure. We’d see each other as often as possible and Jack was very appreciative of how he remained a welcome presence at Wrigley Field, WGN events and anything the White Sox were doing. Mayor Richard M. Daley had a portion of Michigan Avenue, near Tribune Tower, named after him and he did a few commercials. Then-Cubs marketing boss John McDonough took him to lunch regularly and that meant a lot, I know. I never once had a bad experience with Jack Brickhouse. I loved the man, wished I’d known him longer and cherished every moment we were together. This was a wonderful person. I still miss him and I will always work to assure that younger fans, born after he retired from calling Cubs games, know the Cubs had more than one great announcer. On their broadcasting Mount Rushmore are: Brickhouse, Caray, Wilson, Lloyd, Hughes and, someday, Kasper. I consider myself lucky to have been close to Jack in the later years of his career, to have learned from him and to have shown my respect and appreciation. I said on the air during the Cooperstown weekend, “Leo Durocher really wasn’t that smart, for nice guys do indeed finish first. Tom Shaer did a WMAQ-TV retrospective on Jack Brickhouse’s life when he died in 1998. Included are clips of Brickhouse’s Hall of Fame broadcaster’s wing acceptance speech in 1983.